Every so often a player comes along who inspires a group of athletes to perform at a level higher than the expected. It is not necessarily the player who is the best athlete, or the one who performs the best in the given game or match, but the player who brings out the best in his or her teammates. That player is deserving of a Most Inspirational Player Award. This award is often thought of as the same as the MVP award, but that is a misconception. The MVP award goes to the player whose individual performance makes the biggest impact, while the Most Inspirational Player Award is designed for players who inspire better performances out of their teammates. 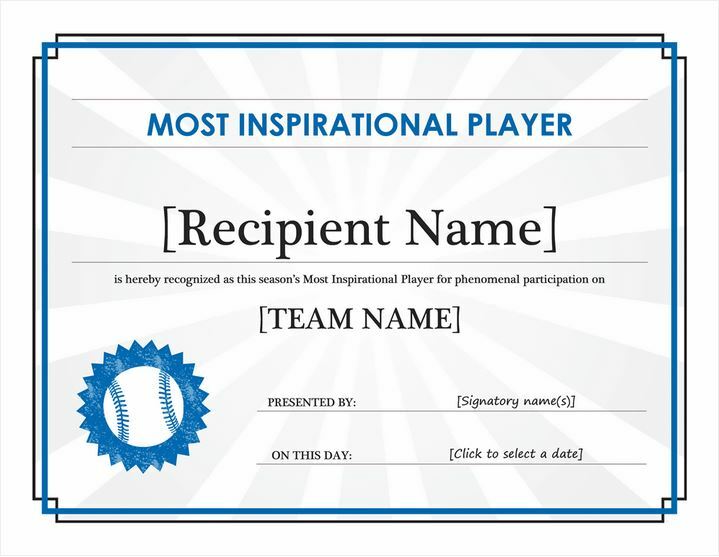 If you want to give out the Most Inspirational Player Award to a person who you have taught or coached, then you will want to use the Most Inspirational Player Award Microsoft template to create the award. Creating the award from the template is a very easy process. Continue reading below to learn more. First, you will download the file from the link provided and open it. Save the original file separately, and that will save you the trouble of having to download it over and over again. Start to create a new template for the specific award you are giving out. Begin by adding the logo of the school, organization or sports team that the award is associated with. Include your name at the bottom, and a space for your signature. Add the date that the award is given out, or the current year. Type up the student’s name in the middle of the document, and ensure that it is big, bold, and easily visible. Use fonts that add a level of glamor to the award. The last thing you want is for the Most Inspirational Player Award to seem lame and unimaginative. When you have typed everything up, print out a sample copy of the Most Inspirational Player Award to look at the finished item. If there are any changes you want to make, go ahead and edit the document. Print out the final Most Inspirational Player Award on glossy paper, and get it laminated if you want the award to be extra special.